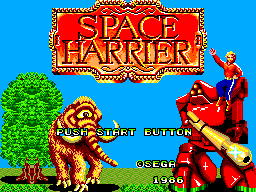 "You are Harrier, the resourceful extra-terrestrial warrior. And space is your battlefield. 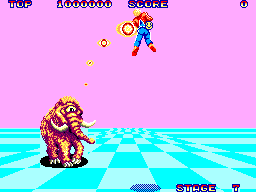 Your mission is to save the Land of the Dragons from vicious creatures led by the vile and crafy One-eyed Mammoth. Aided by only your friends, the Dragons, you find yourself attacked again and again. You fight off one heavily-armed alien after another. You must use every trick in the book. Every skill at your command. The clashes are thrilling and demanding. The combat scenes are powerful. Can you survive the intense fighting? For your sake. For the sake of the Land of the Dragons. You must!" First call up the sound test (see other cheat). After doing this play tracks 7, 4, 3, 7, 4, 8 and 1, pressing Button 2 to select them (do not press Button 1 or it won't work). This brings up a new option screen that allows you to change game parameters. 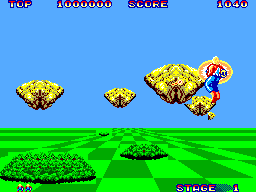 On the title screen quickly press RIGHT, LEFT, DOWN, UP on the directional pad. When the sound test appears press Button 1 or 2 on a track to play. Manual Scan of the USA manual (by Roth) in .PDF format (Adobe acrobat required to view) 701KB in size. Japanese TV AD for the game.